Pet-free and rental-prohibited, this building is a gem surrounded by immaculate, lush grounds to be enjoyed on a weekend stroll or from the units' floor-to-ceiling sceened in sunroom windows. 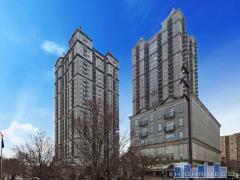 Habersham Estate is a Buckhead high-rise building of 1, 2 and 3 bedroom condos with 575 to 1,600 square feet. Built as a cooperative in 1961, it was converted to condos in 1983. Residents are proud that they have the convenience of Buckhead and easy access to all the best but at out of town prices. Most units have large screened or windowed porches, galley kitchens, separate dining areas, walk-in closets and tree views. Relax by the pool and feel safe with the covered garage; you’ll be happy to call this home. Have any comments or questions about Habersham Estate? Ask your question and/or share your thoughts about this Building.